Built for commercial use on the ground floor and offices on the upper level, this two-story brick Italianate-style building is distinguished by its second-story ornate window hoods and corbelled parapet. Located on the west side of Main Street in downtown Lindsborg, the Berquist and Nelson Drugstore Building's early history has been pieced together using Sanborn Maps, deeds, and property tax records, which suggest it was constructed in circa 1880. Local physician and surgeon Gustav Berquist was an early owner of the building who partnered with Jacob Peterson as "dealers in drugs, paints, and oils." Other businesses that have occupied the building include a grocery store, clothing store, millinery, hardware business, fabric store, and an antique shop. This building was nominated for its architecture and its association with local commercial development. With the assistance of a $6,000 grant from the Carnegie Corporation Library Building Program, the Canton Township Carnegie Library was completed in 1921. It was one of 63 Carnegie-funded libraries built in Kansas during the first three decades of the 20th century. 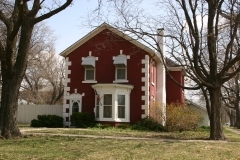 This building was designed by architects George P. Washburn and his son-in-law Roy Stookey, and exhibits a utilitarian character with some Prairie-style details. It was nominated as part of the "Carnegie Libraries of Kansas" multiple property nomination for its local significance in the areas of education and architecture. Constructed between 1915 and 1922, the Darrah Barn is considered a typical dairy barn of the period. It is nominated to the Register of Historic Kansas Places as an example of gambrel-roofed barn constructed with a combination of tile-block and wood frame. 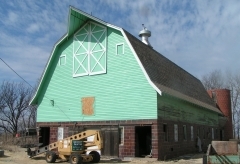 A silo is attached to the northeast corner of the barn. 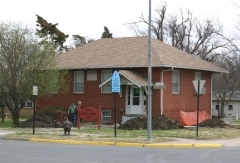 Having survived financial panics in the 1890s, 1907, and the Great Depression, the Farmers State Bank is Lindsborg's longest operating bank. 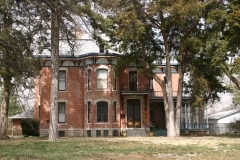 Organized in 1886, the bank's early stockholders represented a "Who's Who" of Lindsborg pioneers. Most retained their association with the bank for decades. The bank quickly outgrew its small one-story frame building and built this brick Italianate-style commercial block at the southeast corner of Lincoln and Main in 1887. 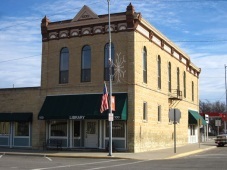 The building is nominated to the National Register for its association with local commerce and agriculture in the Swedish-American community of Lindsborg. Alfred Hjerpe, the son of Swedish immigrants, operated a grocery business out of this downtown Lindsborg building during the 1930s and 1940s. The two-story brick building is located in the middle of the east side of the 100 block of North Main and features two first-floor storefronts with recessed entrances. There is a second-floor apartment that is accessed by an exterior staircase at the rear of the building. 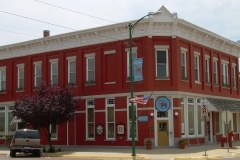 The Commercial-style building retains a high degree of interior and exterior architectural integrity including its original storefronts, entrances, windows, and floor plan. It was nominated for its local commercial history and its architecture. 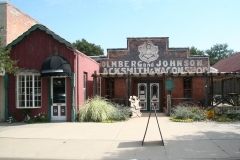 Built by Swedish immigrants circa 1900, this one-story brick blacksmith shop is located in downtown Lindsborg. Oskar Holmberg partnered with Janne Johnson to build a successful blacksmith business that included erecting fire escapes on numerous local buildings. Although Holmberg left the business in 1905, the sign on the building still bears his name. Johnson continued operating the shop until 1954. Local artist Erik Ephraim Malm, who would later gain notoriety when the Acme Company purchased and marketed his a decorative stenciling system, painted the façade sign shortly after the building’s construction. The building's historic features include a stepped parapet, central sliding doors, the forge, and hooks, rings, and window grills, that clearly portray its original function as a blacksmith shop. It was nominated for its association with local business and commerce. Built in 1893, the I.O.O.F. 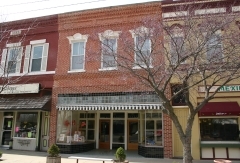 Hall is the only two-story building in downtown Inman. 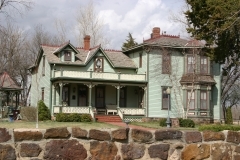 It was constructed by McPherson builder J. D. McKinzie in the popular late Victorian-era Italianate style. As was typical of late nineteenth century downtown buildings, the first floor served as commercial space while the second floor was reserved for meeting space and social functions. Today, the Inman Public Library operates out of the first floor, while the second floor is unused. 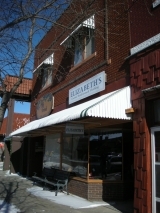 The building features a storefront on the west elevation and a smaller secondary storefront on the south-facing elevation. A decorative cornice sits atop the west and south walls. The building was nominated for its local significance in the areas of social history and architecture.